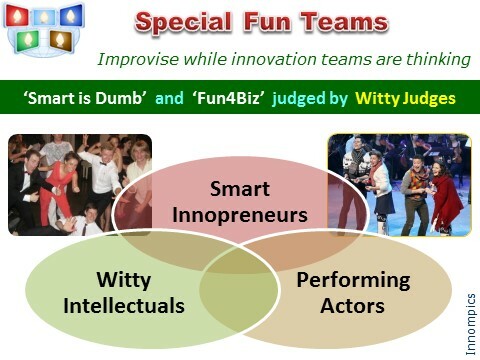 While Innompic teams are ideating, Innompic Fun Teams 'Fun4Biz' and 'Smart is Dumb' entertain and amaze the global audience by their smartness, wittiness and performing skills. 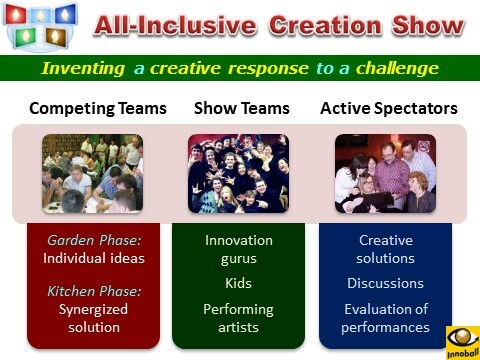 Being really good at smart & fast thinking, these teams improvise instantly and create a performance that has business sense and is relevant to the idea or challenge just announced. Socrates pretended ignorance in order to encourage others to express their views fully. Today, many world's smartest and fastest businesspeople often play dumb. They ask the other party to explain things more than once, ask lots of questions in order to get better prepared to respond and then make a fast decision. Pretend to be dumb, ask clarifying and provocative, yet wise questions in a funny way. Play funny looking ‘What If?’ scenarios. Sing funny silly songs, perform (act, dance, …) in a smart-is-dumb way.